Superman – everyone knows him. That alien from Krypton has truly left an impact on the world since his creation by Jerry Siegel and Joe Shuster in 1938. Being that big of an icon, Superman found his way into gaming once it presented itself as a new popular medium. While Batman has found a good amount of success in the gaming industry, Superman has had a much harder time finding his foothold in games by comparison. This is a list of all of the official Superman games that have been released, along with some that were cancelled. Superman has had a very interesting experience when it comes to the gaming industry, and so it was interesting to chronicle his evolution (or de-evolution) as gaming grew as a medium. 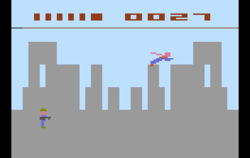 Superman’s first game released for the Atari 2600 in 1978. It was developed by a man named John Dunn, and was simply called Superman. 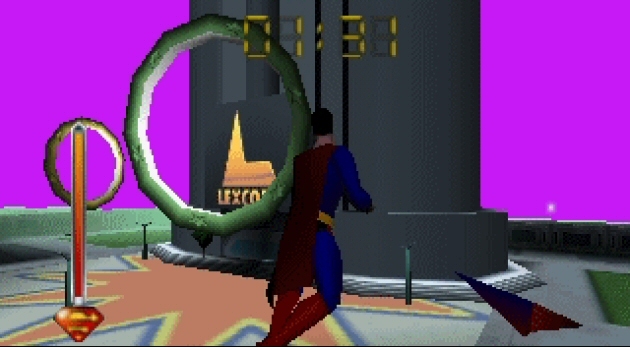 In the game, the player must rebuild a bridge destroyed by Lex Luthor, capture him, turn back into Clark Kent, and return to the Daily Planet in the shortest time possible. 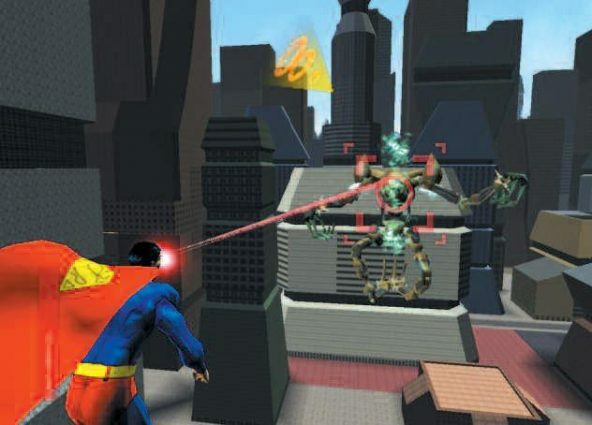 Superman was one of the first games to feature a pause option, and was praised at the time for how unique and innovative it was. While archaic by today’s standards, Superman for the Atari 2600 set the bar high for action-adventure games of the time, though since then the game hasn’t exactly aged gracefully. The character would not get his next game until 1985 with Superman: The Game for the Commodore 64, which was made by First Star Software. This game actually supports two players, and has them either saving the citizens of Metropolis (as Superman) or lure them into their underground lair (as Darkseid). In between the game’s six sectors (levels) the player would have to go through a combat mini-game in order to move on. 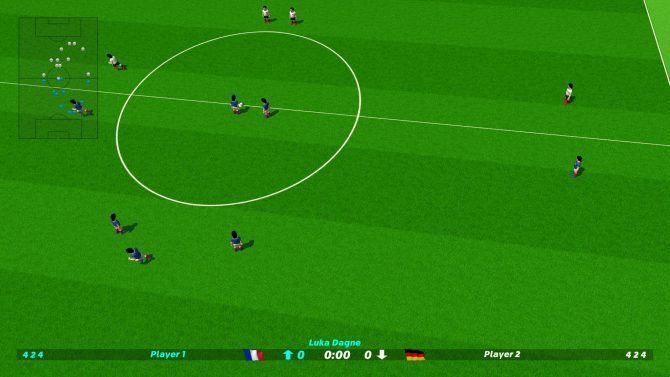 The match ends once a player runs out of energy, or conquers all six levels. This was one of the “combat mini-games” where Superman would have to fly through a tunnel of Kryptonite in 1985’s Superman: The Game. 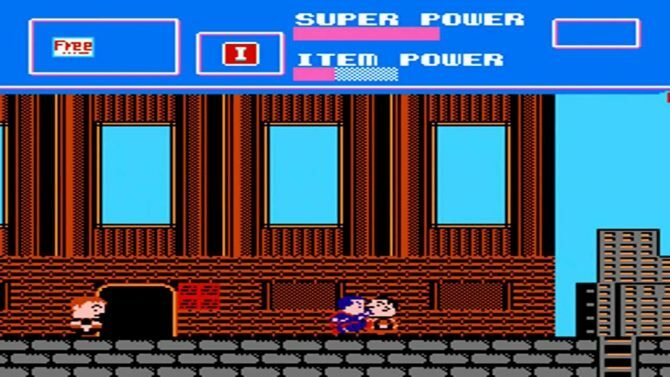 The character’s next adventure would be in a 1987 NES game also called Superman. It was developed by Kotobuki Systems and published by Kecmo. The game is a 2D platformer where Superman has to collect items in order to use his powers and fight Lex Luthor. This game became infamous after it was featured in an episode of the Angry Video Game Nerd show, and is seen as a bad game by many. 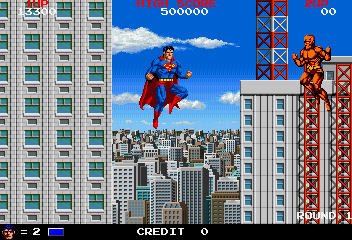 In 1988, Taito Corporation released an arcade game called Superman. This game was a combination of a beat-’em-up and shoot-’em-up, with the player fighting their way through stages to defeat the evil Emperor Zaas. Superman features co-op, with the second player taking control of a red Superman. While higher quality than the Superman games before it, this arcade game has fallen into obscurity since its release. Superman would then return to the Commodore 64 in 1989 with his next title Superman: The Man of Steel, which was developed by Tynesoft and published by Capstone Software. 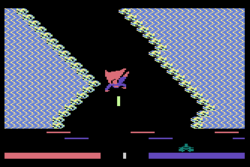 The game is split between three kinds of levels: 3D flying (pictured below) which played out like Space Harrier, 2D side-scrolling levels that play out like other Superman 2D platformers, and vertical shooter levels. The title got decent reviews upon release, with critics praising the game’s comic book style, but criticized it for somewhat frustrating gameplay. In 1992, Sunsoft would release Superman for the SEGA Genesis. Superman’s moves were greatly stripped away, with him only being able to jump, punch, and kick without picking up power-ups, which spawned scarcely, and were really only needed for progression temporarily. The game was panned for limiting the character’s powers and for having a very lackluster storyline; a planned SNES version of the game was cancelled after its release. 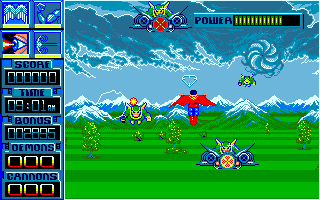 Craftgold and Virgin Interactive would later make versions of the game for the SEGA Master System and Game Gear. Sunsoft would then bring The Death and Return of Superman, based off the comic book stories of the same name, to the SNES and SEGA Genesis in 1993. It was a side-scrolling beat-’em-up where players could punch, grapple, throw, or use ultimate attacks against their enemies. The player’s character changed from level to level, depending on the story. Playable characters other than Superman included Superboy, Steel, Cyborg Superman, and The Eradicator. It is a decent, although repetitive, beat ’em up from that era. 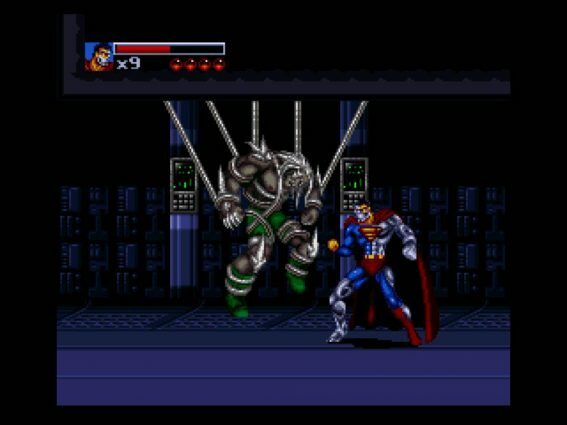 Superman would also be featured in a Justice League fighting game from Sunsoft and Blizzard Entertainment called Justice League Task Force. Unfortunately, this title would garner poor reception due to its cumbersome controls. This would not be Superman’s last fighting game, as he would also appear years later in Mortal Kombat vs. DC Universe and Injustice: Gods Among Us. He will also be featured in the upcoming sequel Injustice 2, which is coming to PS4, Xbox One, and PC next year. These two games weren’t the only Sunsoft projects that included Superman. 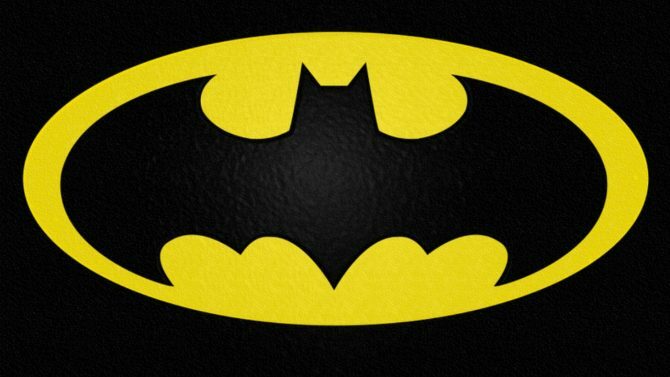 Back in 1992, they were developing a NES game that played very similarly to their famous Batman game. 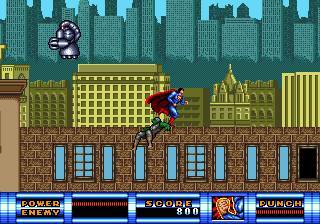 There were also side-scrolling flying missions where Superman would fight enemies with his heat vision. For an unknown reason, DC abandoned their support on the project. It was converted into a title called Sunman, which still ended up never being released, although it was finished. 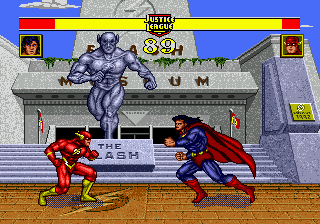 The Superman version of Sunman was recovered years later, and is now in playable form if you look for it online. Oh boy… here’s the big one. In 1997, a company called Titus Software acquired the license to make a game based off Superman: The Animated Series for the Nintendo 64. They wanted Superman: The New Adventures to be the first superhero game where players would really behave like a superhero…what we got was one of the worst games of all time. Due to severe constraints put on Titus Software by Warner Bros, much of the game ended up being stripped back. Eric Caen, co-founder of the company, would later say that only 10% of the original design was implemented into the main game. Still, the game was plagued by horrible control, ugly graphics, and its now infamous levels where Superman must fly through rings. The game’s design was horrible all around, so it was panned by critics of the time, and has continued to have been so to this day. In 2002, Infrogames released Superman: Shadow of Apokolips for PS2, with a GameCube version coming the year after. This game was based on Superman: The Animated Series, just like Superman 64, and had Superman fighting a re-surging Intergang. This game got somewhat positive reviews: while some complained of poor hit detection and somewhat awkward controls, many praised the game’s graphical style, and were relieved that it was not anywhere near as bad as Superman 64. Superman: The Man of Steel, released by Circus Freak and Atari exclusively for the original Xbox in 2002, would be the first of two Atari-handled Superman games. In this game, players are put into a small, open level, and are given several objectives, such as stopping fires or defeating a certain number of enemies, to complete within a time limit. The title received mixed-to-negative reviews due to very awkward controls and the repetitiveness of the timed missions. This would be the last Superman-focused game to hit home consoles for another three years. Atari’s next Superman game, which was made by Mistic Software and called Superman: Countdown to Apokolips, released for the Game Boy Advance in 2003. 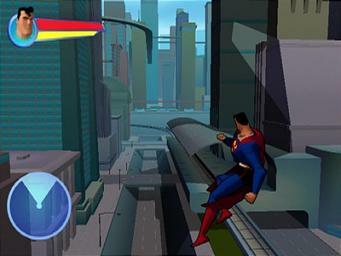 This game played out through an isometric point of view, with the player controlling Superman as he flies around levels in order to fight his enemies invading from Apokolips. While many praised the title’s good graphics for the GBA, it still received mixed reviews due to lackluster gameplay. Superman’s final console game would be in 2006 with Superman Returns, which is based off the movie of the same name. It released for the Nintendo DS, PS2, Xbox, and Xbox 360. 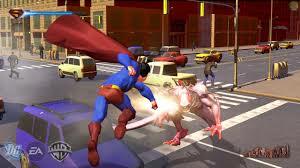 It put players in an open world, with Superman flying around fully equipped with his powers, fighting enemies. 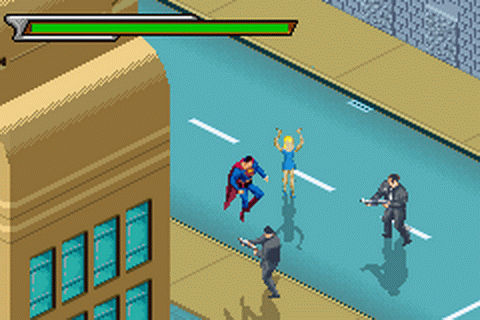 Superman himself does not have a health bar and is indestructible; instead, the city of Metropolis has a health bar, so the player must make sure not to do too much damage to the city. Sadly, Superman did not end his console game with a high note, with many critics panning the game for its lack of a real final boss (the “final boss” is a tornado), poor graphics, and poor controls. 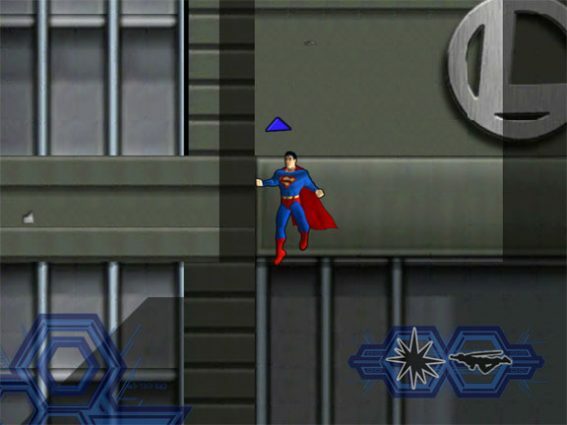 The last Superman-focused game to ever be released was Superman for iOS in 2011. It featured touch controls for Superman, but went by highly unnoticed. Since Superman Returns, the character has found success in other games that he has been featured in, such as Justice League Heroes, the LEGO Batman series and the MMO DC Universe Online. While that is the end of Superman’s released console games, he also has a plethora of unreleased ones. In addition to Sunman and the PlayStation version of Superman 64, there was a game based off of Superman III in development for the Atari 5200 that never saw release. Neon Studios also started development of another Superman game for the Game Boy, but it was never finished. Factor 5 was also working on a Superman game, code-named Blue Steel for the PS3, Xbox 360, and Wii, although due to the company’s own financial troubles, and their publisher Brash Entertainment going out of business, the game was cancelled. It is cited as one of the things that led to Factor 5’s demise: you can check out the only fully-rendered existing game footage below. Superman has had a much more tumultuous series of games than most heroes. He has not yet had that one defining game that stands out from the others like Rocksteady’s Batman: Arkham series. Will the Man of Steel be what Rocksteady attempts to tackle next? Nobody knows, but that is not to say that something good can’t come out of Superman in this medium. Superman has found some success in other games that he has been featured in, but if Superman’s control could be executed right, it would create a very rewarding and engaging player experience. I also wouldn’t mind seeing Telltale tackle Superman once they are done with their current Batman series: only time will tell what comes next for this character. 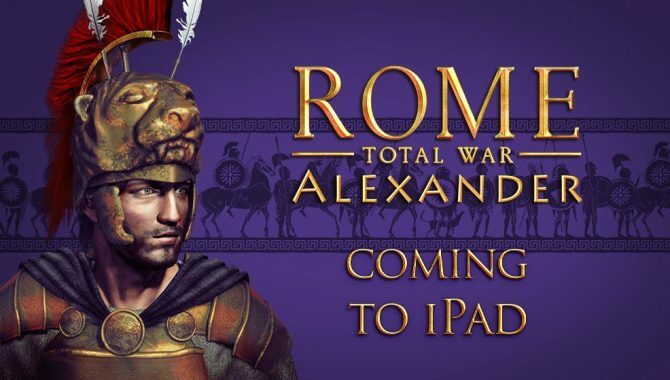 Creative Assembly's Rome: Total War expansion, Alexander, is coming exclusively to iPad later this week.